In France the cheese course is typically served after the main course and before dessert and is called the plateau de fromage. However a cheese platter can be served at any time of day. It is a delicious celebration of aromas, flavours and colours – all of which should be thought about when putting a cheese board together. 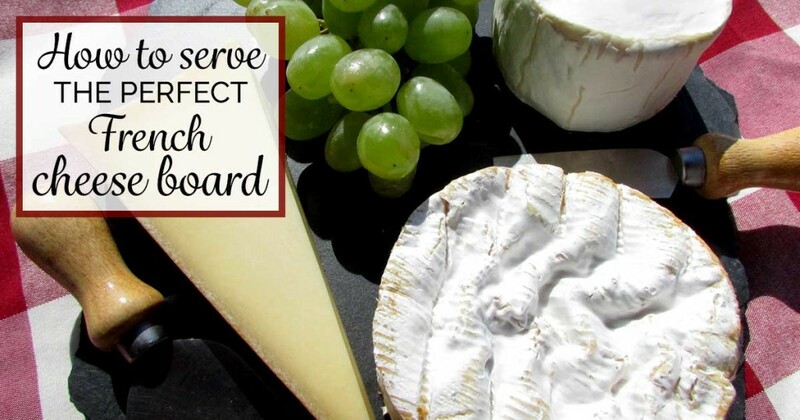 Use a wooden board or slate to serve the cheese so that it is easy to cut. Always provide separate knives for each cheese, as flavours can easily spread. Place the knives next to the relevant cheese so it is obvious which knife should be used for which cheese. Providing more than one knife also means that people can dig in at the same time. Use three to five different types of cheeses on your platter. Find out about the local cheeses and use them, along with one fairly unique cheese to start conversation at the table. Make sure you have some knowledge on the characteristics, origin and names of the cheeses that you offer. Serve the cheese as near to its original form as possible because this preserves the integrity. If it was sold as a small wheel (sometimes called a tomme in the Savoie region of France), serve the whole wheel. Fromage de chèvre maybe in a cylinder, others may be cut from a larger wheel and sold as a segment. Your cheeses should be a good selection from each of the cheese families, explained more on our post ‘An introduction to French cheeses‘. Choose a soft cheese, a pressed (hard) cheese, a goats cheese and a blue cheese. Make sure there is at least one in the selection with a good rind. The rind of a washed rind cheese is washed with alcohol or salty brine and they are often very smelly, but delicious to taste. You can also use different milk types – try adding a sheep milk cheese to the board. A local fromager can help with complimentary flavours. Take the cheese out of the fridge about half an hour to an hour before serving – the temperature of the cheese really matters. When cold the taste is neutralised, so your guests will not get the full flavour of the cheese. Arrange cheeses in a clockwise fashion from mildest to most pungent and complex. This will also help you to remember the names of them as people ask. French cheese boards are often served with grapes and/or French bread, not so much with chutneys as we would in the UK. However if you want to you can pair cheese with nuts, apples, raisins, meats, preserves and even honey but remember that the cheese is the main attraction. If you choose to provide crackers choose mild crackers that will not overpower the cheeses. Each cheese should be eaten slowly, and appreciated, over conversation and of course with wine. Cheeses can be matched with particular wines, ciders, beer and coffee but that depends on the standard of the board you are serving. If you are the one cutting and serving the cheese, there are rules to follow. About a pencil thickness is a good size to slice. With a full wheel cut a slender piece, as you would a pie. If the piece of cheese is cut from a very large wheel and sold as a segment never take the very tip of the cheese, called le nez (translated as nose). This is the most flavourful part of the cheese as it would of been the centre of the wheel. It is considered rude to take all of this part for one person. When cutting from a segment cut along the long side without taking all of le nez, then halve this piece. The flavour of the cheese will change from le nez to the rind, and this should be noticed when eating the cheese.